Join Medicine Bow Lodge & Adventure Guest Ranch at Medicine Bow Lodge in the Medicine Bow National Forest. The best way to see this unique, picturesque mountain range is by horseback. Medicine Bow Lodge is privileged to live in the perfect area for riding. The horseback riding program is like no other. Medicine Bow Lodge has a ride for everyone. They do their best to tailor your horseback riding to meet individual needs. Come ride horses with them and experience what guests call the ride of a lifetime! The cabins are simple, rustic, cozy, and clean. The majority of the cabins are duplexes with adjoining rooms. Each room has its own private bathroom and shower with some cabins sleeping up to eight. Medicine Bow Lodge also has single cabins and also has king beds in several cabins. The cabins are uniquely named after fly fishing lures and Medicine Bow Lodge is able to sleep up to 34 guests. Cabins are located in close proximity to the main lodge where homemade meals are served three times a day. The recently refurbished lodge has added a touch of class to the Medicine Bow Mountains. It features vintage log walls, comfortable furnishings, a huge stone fireplace and space for games, entertainment, and dancing, as well as internet access. The lodge is the cornerstone of the ranch. It is the ideal place to play games, enjoy billiards, foosball, and ping pong. There are lots of comfy sofas and chairs to settle in with a good book. The dining room is always open to getting something to drink or a grab a snack. Debbie and her kitchen staff always have something yummy in the cookie jars or on the snack table. Arrive at the ranch anytime after 15:00. You will enjoy your three meals during your stay. Horseback riding is included and there are lessons for you to book every day and according to your own needs. There are also activities that families, friends, and a single guest will find entertaining after riding. Medicine Bow Lodge & Adventure Guest has a horseshoe pit, roping 101, archery, volleyball, barrel riding, target shooting, trap shooting, pottery, and lots of board games. After a day of riding or hiking, you may like to sit back and relax in their hot tub or sauna. Every evening during the summer and fall, there is a campfire (as long as there isn’t a fire band) after supper with all the smores fixins and on some of the night's great music along with fun and memorable conversations. On the last day, depart after breakfast. Guests who have riding experience will be allowed to be more adventurous and go on fast rides, which includes loping and trotting guided by the well-trained wranglers. Medicine Bow Lodge has a lot of first-time riders. No worries, you will be in great hands. Their wranglers will make sure that you are comfortable in your saddle and each ride you become more confident. Before you know it, you will want to go on the all-day ride and or join Medicine Bow Lodge’s popular overnight pack trip. Children and teens love riding here at Medicine Bow Lodge. Families are encouraged to ride together, but at the same time, Medicine Bow Lodge does not want to hold guests back that are more advanced with riding abilities. They allow children from six and up to ride horses. Children and teens will have the opportunity to play games on the horses, in Medicine Bow Lodge's way. Don't forget the young children of five and under. The kid’s wrangler will gently lead your young one on a horse around the grounds of the ranch. This is a great time to take advantage with a picture moment. The remuda of 20 horses is all well trained, sure-footed, and easy riding for the beginner as well as the advanced rider. Meet the wonderful horses who love to ensure guests and visitors alike enjoy their wonderful rides throughout the Medicine Bow National Forrest. Bay is a really pretty bay about 15 hands tall. The staff and guest have really enjoyed him this summer. Beauty is a black Paint with some white spots. She is a pretty small horse compared to all of the others. Bell is a pretty Paint mare and an easy smooth ride. A lady's horse or easy going man's horse. Comanchie is a solid Paint, very easy to ride. He has a wonderful blue eye. Diesel is a black bay with a white stripe in the middle of his face. Diesel is an easy going horse, fast, and smooth. Hidalgo is big stout paint. He has perfect markings with a saddle on his back. He is green right now but will be ready to ride sometime this summer by staff. He is becoming a great trail horse sturdy and solid. Hidalgo is still a work in progress so be prepared if he acts upon Tim. Kiowa is small sorrel, fast, and steady. He may be a pasofina cross. Millie is Tim's mare and she knows she is pretty. Just under 16 hands with black and white paint. She is a smooth ride. Mona is the pretty bay Appaloosa. A super calm and easy mare. Pedro is a man's horse. He has an exceptionally smooth walk. Women like him too and he never lets you down. Rocker is a big good looking sorel with three white socks and full blaze and a roman nose. Rocket has been with the ranch for about four years and has become a favorite of the guest. Rocky is a red sorrel with two white socks and easy going. Solid favorite and doing very well this summer. Stue always travels with his girls, Cassie, Beauty, and Mona. He is a leopard appaloosa, smart, and has a personality that you won't forget. He never meets a stranger. Tex is 14.2 hands and a great ride for the right person. Medicine Bow Lodge is located in the Medicine Bow National Forest of Wyoming, USA. It is nestled up against Barrett Ridge along the Barrett Creek that runs into the North Platte River. Medicine Bow Lodge is surrounded by the mountains including Kennaday Peak, Medicine Bow Peak, and Sugar Loaf. This mountain range, appropriately named the Snowy Range, is a great terrain for horseback riding, hiking, camping, hunting, and more during the spring, summer, and fall seasons. When winter hits this area, it becomes a snowmobile haven with over 300 miles of trails, with endless powder riding. Guest also enjoy cross-country skiing and snowshoeing, also many hills to sled down with family and friends. Medicine Bow Lodge is proud of its long heritage and welcomes its guests to come to see one of the most beautiful areas of the west. The Snowy Range with its alpine terrain is unique in its beauty and splendor. Old mining and logging towns can be seen on horseback rides within just a few miles of the lodge. Hundreds of lakes, ponds, and streams fill the valleys. There are breathtaking views that pictures just can't capture on film and represent the majestic scenery and history of the area. Take Highway 1-70 to Denver, then 1-25 North to Fort Collins, and then Highway 287 northwest to Laramie. From Laramie, in the summer, take 130 west to Centennial and then up over the pass to the ranch. Medicine Bow Lodge is 55 miles from Laramie between Mile marker 55 and 56. If you pass The Ten Mile Inn, you have gone too far. In the winter, the pass is closed, so it is necessary to continue to 1-80 through Laramie, west, past Arlington and Elk Mountain to Highway 130 at Walcott. Exit I-80 at Wallcot Saratoga Highway 130. Take 130 south past Saratoga and then go 8 miles. Turn left on 130 to the east, go 12 miles, and Medicine Bow Lodge is on the right. In the summer, take 1-80 to Laramie exit on 311 the Snowy Range Byway and go left under the interstate. Then, turn right before the shell station and head toward Centennial, Wyoming. You will go about 55 miles and turn left into the drive between mile marker 55 and marker 56, directly across from the Brush Creek Visitors Center. In the winter, take the Walcott / Saratoga exit. Exit 235 and turn south to Saratoga about 20 miles. Continue south past Saratoga and then go 8 miles. Turn left on 130 east, go 12 miles, and Medicine Bow Lodge is on the right. Please book your flight to arrive at Laramie Regional Airport (LAR). Transfer from and to this airport is available upon request. 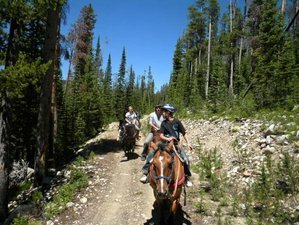 Medicine Bow Lodge & Adventure Guest Ranch is located in the Medicine Bow National Forest of Wyoming offering ranch and horse riding vacation. This vacation is available from May 13 to October 31, 2018, please select an arrival date below.